Echoed by me, at frequencies that only dogs can hear, ironically enough! Mr John Cleese, Minister of Silly Walks, has offered up one of his cats for sale on Twitter - the asking price is £4,000,000 o.n.o. I can't help wondering what this moggy has done to deserve such ignominy, but his resemblance to a certain Greebo may go some way to explaining it . 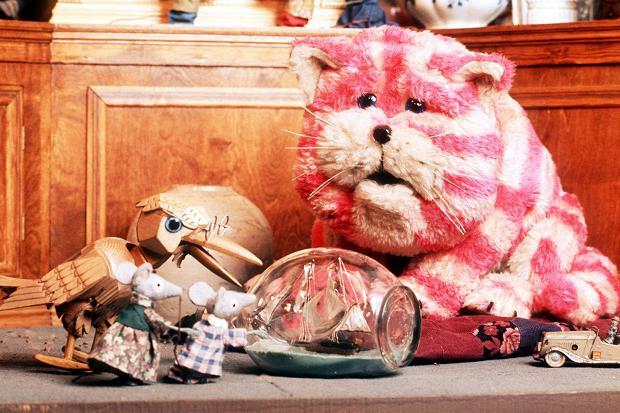 . .
Oh how I loved Bagpuss as a a kid, pure magic. Our not so saggy cat has caused Martyn to coin a new word this morning, Dinky was sat on the front door mat , washing her paws after breakfast ( I have to feed her before I have mine, or I get angry kitty yowling until food appears in her bowl ) and despite being fed gave a few yowls, I asked if she need a cuddle, and got stared at instead. Martyn said she was Poopgry! Needed to poop but it was too cold and dark ouside for her to go out , and she diddnt wasnt to use her litter tray, so she was Poopgery or possibly peegry , makes a change as she is normaly Hangry at any time of day. i awoke in the wee small hours (arund 4 am to be exact) for a call of nature. When i returned to bed na'taoth (aka the floofmonster) was lying on the bed on her back, paws in the air. I could not resist and tickled the super flooofy belly. Here;s the thing, this cat can purr around 35Db on a bad day, 45 on a good one. Self-inflicted, totally your own fault. Either learn to sleep to the purr, or learn not to touch the fluffy! Ahhh cats! Don't you just love cats who have toy balls to play with, toy fish to chuck up in the air and bunny kick to death with their back paws, and magnificent cat trees to climb but actually all that they need to entertain them is a piece of string, a scrunched up piece of paper and a plastic bag. Buster has taken to going mad over a scrunched up lottery ticket (not a winning ticket of course! ), running around playing football with it, throwing it up in the air and bunny kicking it. I want a Bagpuss teacosy!!!! and I don't even own a teapot!! Look at the little feets! Sorry as a knitter - Argh that yarn (that fluffy one) in BOBBLES!!! (for the toes). Sandra wrote: Sorry as a knitter - Argh that yarn (that fluffy one) in BOBBLES!!! (for the toes).